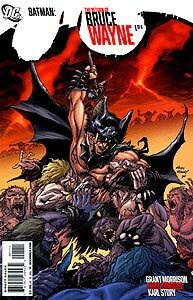 Setting: Gotham City, DCU, USA, 20,000th-century B.C. Brief Synopsis: Lost in time, Batman struggles to find his bearings. Booster Gold, Green Lantern, Superman, and Rip Hunter visit Earth's prehistoric past in search of Bruce Wayne, who is apparently bouncing through Earth's history. 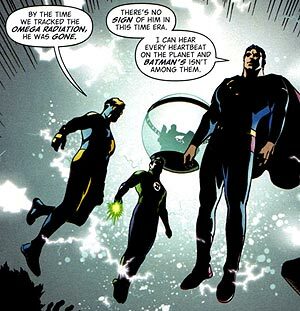 Booster's "Omega Radiation" comment is a reference to the Omega Effect employed by Darkseid, the New God who "killed" Batman during the events of Final Crisis. Boosterrific Review: Heavily steeped in Batman tradition and Silver Age continuity, I enjoyed this issue in spite of myself. Still, the book fails to shed any real light on Batman's situation, creating even more questions than it answers, and doesn't even really begin to tell a story that has to be concluded in only 5 more issues. To the point, this issue about is what one could expect from a contemporary Grant Morrison story. Whether that is an asset or not is for you to decide. This issue gets 3 stars ONLY because of the appearance of Booster in the panel shown above. The scene is a pretty well drawn one, and the angle looks real slick. I was expecting something a bit more memorable here. Have to wait and see what Grant Morrison has planned next, but this book is not as gripping as I expected it to be.